We all have to do our part. Whether it is big or small part, it is all part of the momentum to "push the giant flywheel". ABC News: Ben Affleck's Journey Through the Congo. Actor, writer, producer and director Ben Affleck traveled to Africa's Congo region three times over the last eight months, hoping to understand firsthand one of the world's worst humanitarian crises of this century. "Congo is in terrible shape," Affleck said. "What's going on [in Congo] is humanitarian disaster." Affleck says the mission of his journey was to help people understand that the situation "could have a real ripple effect down the road" and hoped that his video essay "will be one small incremental step in that." The "Indiana League of Women Voters" NEEDS a Life! "The League of Women Voters of Indiana filed a lawsuit Friday challenging the state's voter ID law as a violation of the state constitution." This challenge comes just two months after a U.S. Supreme Court ruling upheld the Indiana law. Also, we have voted in eight elections under this 2005 law. So, how many suits does it take before it becomes an "accepted" law. I think it is time to move onto some other important issues in the state, the U.S. or the world. Here is a worthy cause to stand up for someone's right. House Resolution 1227 is circulating the halls of the US House of Representative. The resolution condemns the systemic violence against women and girls in the Congo. The UN issued its condemnation on Friday about the suit time the Indiana Leage of Women Voters was filing their suit. It would be a NOBLE, MORAL, GREAT and RIGHT cause for the US League of Women Voters to urge our Congress both the House and Senate to challenge the international community to stop the violence against women and girls in the Congo. The Indiana League of Women Voters needs to act on behalf of their voiceless sisters who really need their help. Everyone who wants to vote in Indiana should have free state issued ID by now. A 16-hour Greyhound Bus Trip to Washington DC! On Monday afternoon, I took a 16-hour Greyhound Bus trip to Washington DC to attend Bread for the World's Annual Lobby Day. I made it to the conference ontime Tuesday morning. Unfortunately, I was recognized by a conference leader for biggest sacrifice or something of the sort. The idea of going by bus came to me while watching the Today's Show about a month ago. Everyone was lamenting the cost of vacations over Memorial Day weekend and the summer. Four dollar a gallon gas was forthcoming. They stated that bus and train trips were an alternative to costly airfares and driving. So, I decided I would try the bus or train again after over 40 years. I chose the bus due to its more convenient schedule. Also, it was cheaper in cost. At the end of the conference, it finally hit me. No, it was not the fatigue or sacrifice, but the blessing of living in the US. I was reflecting on the purpose of conference. I had come to gather support for the Global Poverty Act and a $5 billion increase in the Poverty Focused Development Accounts for 2009. I had travel options on getting to Washington: drive, air, bus, or train. In the Congo, millions of poor people do not have an option. They must walk or they maybe fortunate enough to ride a bicycle. I remember a man who rode his bike from Kananga to Bulape and back to Kananga, a round trip of 300 HARD miles. All the trips including his visits were done in a matter of 2-3 weeks while were there. There are no buses. The train is overcrowded and runs on an irregular schedule. And there is no scheduled air service. I also remember it took us 17 hours by a 4-wheel drive Toyota Landcruiser to go the 150 miles from Kananga to Bulape. That was the trip I will always remember. That's why I came to Washington because they have no options to escape the poverty cycle. So, a 16-hour trip to Washington on a Greyhound Bus is reason to be thankful. Three people in Congo have died from an Ebola-like haemorrhagic fever. These cases are up in northern Congo's Equateur Province. Is it Ebola? The Center for Disease Control has not officially said it is another Ebola outbreak. Congolese health authorities are doing a good job. Health authorities recorded the first death on May 29. That's quick action. During the last outbreak in 2007, the first death occurred in June but the outbreak was not recognized until late August. Dozens of people were died by the time health authorities were mobilized. IRIN Africa | Great Lakes | DRC | DRC: Suspected haemorrhagic fever kills three in Equateur Province | Health & Nutrition | News Item. KINSHASA, 13 June 2008 (IRIN) - Three people in the Democratic Republic of Congo's Equateur Province have died from what is suspected to be haemorrhagic fever, according to medical sources. Samples collected in Boende, 300km east of Bandaka, have been sent to the Centre for Disease Control and Prevention in Atlanta in the USA, to determine whether or not the disease is viral. According to its spokesman, Eugene Kabambi, the UN's World Health Organization has sent a team of experts to Boende together with government doctors. "The third death, that of a child, was reported on Wednesday" 11 June, said Jacques Mokange, the province's medical inspector. I attended the 2008 Basic Utility Vehicle (BUV) Competition on Saturday, April 19. Congratulations to this year's winner, Alfred State College! I was totally inspired by the innovations and versatility. The BUV will change the lives of the rural poor. I can't wait to get a second vehicle in Congo. Just days after the European Union (EU) banned Hewa Bora Airways, a crash in Goma in eastern Congo killing 83 passengers and crew on board. Hewa Bora Airways was the only Congolese airline authorized to fly to EU countries. The EU had certified just a single airplane from Hewa Bora Airways. The EU cited maintenance issues of Hewa Bora Airways. In the past, Hewa Bora Airways was the airline of choice. It can best be described as the African cousin of Southwest airlines. You get a boarding card which entitled you to fight for a seat on the plane. Pre-assigned seating is a concept and in name only. Your assigned seats are not honored. Hewa Bora Airway flew between three times a week to Mbuji Mayi and Kananga. Twice weekly, the flight originated in Kinshasa then flew to Mbuyi Mayi then Kananga and back to Kinshasa. On the other day, it flew Kinshasa to Kananga, then onto Mbuyi Mayi and return to Kinshasa. If you were going to Kinshasa, you wanted to on the latter route. Otherwise, it appeared to be more stressful finding a seat. It is sad event because most Congolese airport lacks emergency services. You could survive the crash but die from the secondary fires. Also, you could die when awaiting or getting emergency medical care. The travel in the Congo is so dangerous. There are no paved roads. Trains and boats are properly maintained. 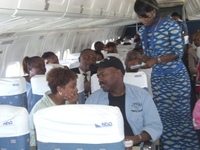 Unfortunately, the average people can not afford air travel because of extreme poverty in the Congo. Link: Air crash in Africa kills more than 80 - CNN.com. (CNN) -- A plane crashed Tuesday shortly after taking off from the Goma airport in the Democratic Republic of Congo, killing 83 passengers and crew on board, a foreign ministry spokesman said. The Hewa Bora Airways DC-9 was heading from the city of Goma in the eastern mountains to the central city of Kisangani when it plummeted into a neighborhood near the runway, spokesman Antoine Ghonda said. The Democratic Republic of Congo, formerly Zaire, has a dismal aviation record. There have been at least 24 plane crashes in the past year, according to the Aviation Safety Network. I bet this is what she is doing now.